What’s the Appeal of Mishima Yukio? – Everything is Oll Korrect! It’s a fair question, and one that I could have dodged by saying I just like his novels. I certainly do love his novels, but that isn’t what first attracted me to his work. Rather, my first exposure to him came in my days as a college-age delinquent. He was one of a handful of authors in the university library’s small section for Japanese language and literature, and since I didn’t have a lot of time I grabbed the shortest book there, Sun and Steel. How many lazy men’s truths have been admitted in the name of imagination! How often has the term imagination been used to prettify the unhealthy tendency of the soul to soar off in a boundless quest after truth, leaving the body where it always was! … And when this type of arrogance of the imagination links together the artist’s act of expression and its accomplices, there comes into existence a kind of fictional “thing” – the work of art — and it is this interference from a large number of such “things” that has steadily perverted and altered reality. As a result, men end up by coming into contact only with shadows and lose the courage to make themselves at home with the tribulations of their own flesh. Here we move a little closer to answering my friend’s question. Reading Mishima, I sensed that his obsession with death was not a nihilistic fixation or a fetish. Rather, perhaps a noble death is something of an aesthetic concern? 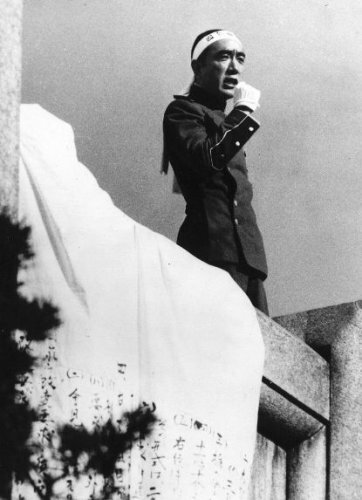 Mishima grew up during the Pacific War, and was surrounded by men going off to die heroically. Going back to Sun and Steel, he relates his observations after reading letters written by kamikaze pilots at a museum exhibit. The letters were full of clichés about duty and honour and destroying the enemy, all the equivalents of “Dulce et decorum est pro patria mori,” and yet “ready-made though they might have been, they were special words, set at a height loftier than any commonplace action could ever attain… They were not simply beautiful phrases, but a constant summons to superhuman behaviour.” He goes on to refer to a classical model of heroism, which is a physical ideal that also rests on these “ready-made” concepts. Such phrases about duty or honour or strength are “lost to us nowadays.” Mishima wanted a heroic death, but how does one attain this in peacetime, and especially in an age of decadence? This, at least, is what I got out of Sun and Steel, a means of revolt against the modern world. Life in liberal modernity is soft, easy; there is nothing heroic in working a dull office job, growing fat, and living for oneself within an atomised “nation” with no sense of the transcendent. One way out is to grow hard, live a more ascetic lifestyle, work muscles one doesn’t need. Ideally, ones church should provide some sense of the transcendent, but modern Christians are more concerned with tolerance than truth, and I sensed that my childhood heroes, men like Alfred the Great or Richard Lionheart, in some important way had more in common with this Japanese pagan than they did with the diocesan bishop. I had never cared much for my body; I spent hardly any time playing sports as a boy and disliked working out. Why would I care about such things? It seemed pointless, but suddenly Mishima gave me a reason to care about them. So, what should we make of his suicide? Why does it seem heroic, rather than a sin of despair or the act of a madman? In part there’s a cultural difference – seppuku could serve as a final, desperate admonition from a samurai to his lord, and this was likely Mishima’s intention – a desperate urging to restore Japan’s traditional, martial virtues and restore imperial authority. That gives a context to Mishima’s suicide that allows me to understand it to some extent, but one can understand an action without admiring it. Why would I not simply consider this a noble-minded but grotesque and ultimately fruitless attempt at glory? I came upon an answer when I remembered that in the Divine Comedy, Dante placed Cato at the gates of Purgatory. At first, this seems extremely odd – Cato had fought for the same cause that had landed Brutus and Cassius in the deepest level of Hell with Satan and Judas Iscariot. Furthermore, he’d committed suicide, and Dante had earlier passed through a circle of Hell just for that very sin. The key, I believe, is that Cato killed himself to emphasise the importance of law and liberty, to demonstrate that it is better to die free than live as a slave. In other words, Cato killed himself not out of despair, but out of zeal for the good of rule of law, and though he expressed this zeal in decidedly pagan fashion, Dante could see the virtue and moral reasoning, however imperfect, at work. So with Mishima. While it’s popular to engage in amateur psychoanalysis when discussing Mishima’s life and death, I think his stated reasoning was genuine, and that’s what resonates with me. Like Cato, his action was flawed, but he was right to protest strongly against the decadence of liberal modernity, and to urge a renewed devotion to the emperor. One may object that this approach tends toward a moral relativism, that it follows from this that an action is good as long as one’s intentions are good. However, I’ll emphasise that I make no defense of suicide in itself, and again, I do believe that it is inherently evil. We must, however, take some account of circumstances in judging such things; while it ought to be strongly discouraged everywhere, Japan does have an unfortunate tradition of viewing suicide honourably. Besides, if it’s good enough an explanation for Dante, it’s good enough for me.